You will notice that I refer to LEARNING TIPS at the bottom of most of the recipes on Urbnspice. You will also notice that some of the learning tips are repeated frequently. They bear repeating. I will do my best to link the LEARNING TIPS from the individual posts to this page for reference purposes. LEARNING TIPS will be continually updated to bring you more relevant tips and techniques as I add content to Urbnspice. This is also the section that you will find definitions and explanations regarding particular ingredients (such as extracts), certain basic tools or certain techniques. These small details will make your baking experience much easier and more fun. Some of this information has been learned through trial and error, such as the differences in the types of cocoa powders and the impact that this ingredient can have on your baked goods. Other tips and techniques have been handed down by my mentors, colleagues, family and friends. This information is designed to help you better understand the methods and techniques utilized in the recipes such as, why it is important to toast nuts, or why it is essential that you know the accurate temperature of your oven with an internal oven thermometer, and so much more. I hope you enjoy this learning strategy on Urbnspice. In the spirit of paying it forward, the following LEARNING TIPS will be reviewed in this section. NOTE: Individual LEARNING TIPS are listed Alphabetically. Please scroll down to each heading for Learning Tip details. CHEF TALK: a “bain-marie” is a French culinary term for a cooking technique which is a gentle method of cooking delicate foods such as sauces or custards by using water as an insulating factor. Other terms used for this cooking technique are a double boiler, water bath, or the English translation, Mary’s bath. A bain-marie can be used on top of the stove (for the purposes of this book), in a warming vessel, or in the oven, all for different reasons or techniques. On this blog, there are examples of using a bain-marie in posts such as Sabayon, and it is used for melting chocolate safely like in Individual Baked Dark Chocolate Mousse in Crispy Wrappers. A container (bowl) containing the food, is placed over a saucepan which has barely simmering water in the bottom. The water must never touch the bottom of the bowl. Warming a delicate or temperature sensitive food, such as reheating lemon curd or chocolate ganache. CHEF TALK: There are a few tools in this section that are very useful in the world of baking. These are some of the items that I use with sufficient frequency that I could not do without. I refer to a cookie scoop in a number of recipes. These are wonderful kitchen tools that can be used for many purposes. They are commonly known as ice cream scoops and are found in kitchen supply stores. You can find them in a variety of sizes, ranging from 1 teaspoon to mega-sized scoops. I use them for so many things! Scooping cookies quickly and consistently are imperative in the pastry kitchen, so cookie scoops are always near at hand. My cookie scoop of choice for making tarts is a small scoop (1 teaspoon or 10 – 15-gram capacity), which is also perfect for a mini tart; and a medium scoop (approximately 1/8th of a cup or 40 – 50-gram capacity), which is perfect for the 3-inch tarts. Portioning muffin batter becomes an easy task with a scoop. I refer to these two scoop sizes quite often – small scoops for mini muffins and medium scoop for regular muffins. Using scoops for portioning just about anything will ensure a consistent baking time and result. (Try The Best Ever Banana Muffins or Good Morning Cranberry-Coconut & Carrot Gluten-Free Muffins to practice scooping muffin batter. Spatulas are really not all that simple. Contrary to first impressions, a spatula is one of the most versatile tools in the kitchen. A spatula can be used for baking, cooking, stirring, folding and blending, scraping and the occasional rap on the knuckles of an overeager taste-tester! I discuss this in more depth in the post from the My Favourite Kitchen Tools Series – “The Simple Spatula”. The varieties include silicone spatulas, off-set spatulas (a pastry chef’s third hand), a combination spatula and spoon scraper, and a variety of pan and bowl scrapers with different shapes, sizes and materials for a wide range of uses. Perhaps it is my frugal nature, but I cringe when I see people dump bowls or pans into the sink that have so much goodness left in them, particularly when it is chocolate ganache or crème anglaise. If you choose to have only one type of spatula in your kitchen, I would recommend one made from silicone. It should not be too flexible. It is durable, heat resistant, and has a slightly curved and squared off base which is perfect for getting into the corners and bottoms of things. Quality pays off (no dollar store spatulas, please!) and the right utensil will give you many years of solid use. It is a personal choice in the end. Baking is a precise science. One of the most important factors that will make the difference between a successful baking experience and a frustrating one is determining the internal temperature of your oven. This is easily achieved with a very simple tool that has a relatively low cost (approximately $ 5 in a hardware store) called an oven thermometer. This important tool sits on the rack or hangs inside your oven and displays the internal temperature of your oven. This is not to be confused with a digital thermometer, where a probe is inserted into the food cooking inside the oven to measure the cooking temperature or doneness of the food (i.e. roast chicken). CHEF TIP: If the internal oven thermometer displays a different temperature than what your external oven temperature dial is set to, then you can adjust accordingly. For instance, if the external oven temperature dial was set to 350oF, and the internal oven thermometer displays 325oF, you can raise the external oven temperature dial 25oF to 375oF to raise the internal temperature. If the difference varies more than 50oF, it is probably wise to get your oven calibrated by a professional oven technician. Blanching is a process of placing vegetables or fruit in boiling water for a very short period of time and then shocking the food by placing in an ice bath to stop the cooking process. Blanching is used to preserve colour and texture of food, or to prepare food ahead of time; or for preparing food for freezing. 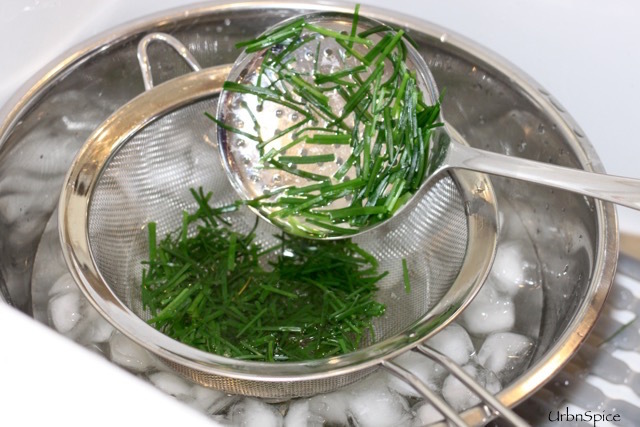 I will use the example of blanching chives to explain the process. This is an important technique to understand when making pies, tarts or tartlets. Essentially, blind baking is the process of baking a crust without putting the filling in it first. It is used for different purposes. Sometimes, as in the recipe, White Chocolate and Lemon Curd Tart, the crust is baked and then the curd is poured into the baked crust. This technique is used to partially bake or fully bake a tart shell. In order to support the sides of the pastry crust (since it is empty), place a circle of parchment or quick release aluminum foil which is larger than size and height of the tart pan. Place it on top of the prepared dough in the pan. CHEF TIP: Ideally, try to do this on a tart crust or pie crust which is frozen or well chilled. This paper or foil lining must be filled with something that will support the sides of the pastry from collapsing onto itself while it is baking. Dried beans are often used. These beans (or lentils or rice) should be stored in a container and labelled specifically for use for blind baking. You can use these blind baking beans over and over again. I am lucky to also have as part of my pastry equipment some clay pie weights in a vintage jar. The bean-filled parchment paper lined tart shell is then partially baked (approximately 10 – 14 minutes for a large tart and 8 – 10 minutes for a smaller tart). The tart pan is then removed from the oven. The bean-filled paper is carefully lifted out. The tart shell (which has now baked long enough to support itself, can be placed back into the oven and baked again until it is golden brown. In some recipes, where a partially baked crust is required, the crust is set aside to cool while the filling which is to be placed into the partially baked crust is prepared. To practice this technique, try making Decadent Dark Chocolate Tart. When the beans for blind baking are cooled, they are returned to their storage container for the next blind baking session. You will note that some of the recipes call for a small amount of melted chocolate at the end of the list of ingredients. It is brushed on the bottom and sides of a pre-baked and cooled tart shell. This step is important when you are filling the tart shell with a moist filling such as a curd or pastry cream as it keeps the pastry crisp and prevents it from becoming soggy. The process is as follows: melt 3 – 4 oz. of melted dark or white chocolate and brush onto the bottom and sides of the baked and cooled tart shell. Let the chocolate set until firm and then pour the filling on top of the coated pastry shell. Measure the required amount of gelatin powder needed in the recipe. Gently sprinkle powdered gelatin over some of the cold water or liquid requested in the recipe. Microwave for a few seconds or add the bloomed gelatin to hot liquid. Whisk the gelatin into the liquid quickly to incorporate it well. Each packet of gelatin powder will set 2 cups of liquid. To practice using gelatin powder, try making Coconut Orange Vanilla Pudding or Strawberry Creams Custard. Once the gelatin sheets are soft, lift them sheets from the cold water and squeeze the excess water from them. Add the softened gelatin sheets to room temperature liquid (whatever is called for in the recipe you are making). Heat the mixture, stirring until the gelatin is dissolved. Be careful not to let it boil. If the liquid is too hot, it will not set. The recipe will generally indicate how much liquid will be used to bloom the yeast. Sprinkle the dry active yeast on top of the warm liquid. Stir the mixture just a bit and leave it alone for 5 minutes. The yeast will become bubbly and frothy. If you want to practice this, try making the Cinnamon Rolls with Vanilla for someone you like a lot. I use unsalted butter (sometimes called sweet butter or fresh butter) in my recipes. It is best to use unsalted butter in baking and, for that matter, cooking. Using unsalted butter gives you more control in the baking and cooking process. Salted butter is very different and cannot be substituted for unsalted butter. The salt in salted butter acts as a preservative. It is often very difficult to determine from producer to producer how much salt is actually added to their salted butter. The technique of chiffonade is used widely in the professional kitchen and it is really not difficult to do. It is a knife skill, pure and simple. It uses a slicing technique where herbs or leafy green vegetables like basil, kale, spinach and iceberg lettuce are cut into long, thin strips. Here is a video that explains how to chiffonade beautifully or step-by-step technique in my post How to Chiffonade. CHEF TRIVIA: Also known as heavy cream, whip and whipping cream. Whipping cream is the only cream that you can boil without it separating as there is enough butterfat (ranging anywhere from 33 – 40%) cream to keep it from separating (breaking). For the ganache: the recipe will call for bringing the cream up to a boil. This is important for many reasons: You need the cream to be very hot before pouring on the chopped chocolate so that it will melt the chocolate more effectively than warmed cream. Otherwise, you will be left with a lovely bowl of floating chocolate chunks! Never leave a pot of cream on the stove top unattended – once it comes up to a boil, it wants to get going – in a big way! Let’s just say that you want to avoid the possibility of a major clean up after a boil-over! HALF & HALF CREAM: Used for: sauces such as crème anglaise, puddings, and other custards. Crème Fraiche or Sour Cream: Crème Fraiche is a soured cream, very decadent with about a 28% butterfat. Sour cream is a tangier version with about 18% butterfat and is often used interchangeably for crème Fraiche. Both crème Fraiche and sour cream are staples in any pastry kitchen. Creaming butter (or other fat, such as peanut butter, shortening or butter flavoured shortening) and sugar is the process of mixing the two ingredients together to produce a light and fluffy mass – it usually takes several minutes (3 – 4 minutes) at medium speed in a mixer. Granulated sugar is often used for pie and tart dough although brown sugar or a combination of granulated and brown sugar is often used as well. WHY? Creaming is important to produce a baked product that is tender, light and not dense. It incorporates air into the ingredients, helping the food to rise. It also blends the sugar into the butter thoroughly, thereby dissolving the sugar granules and producing a very smooth mass. 1) Use room temperature butter. It will yield better results. Resist the temptation to melt the butter as you will produce an entirely different product with a dense and “greasy” texture. 2) If the butter has not reached room temperature by the time you need it, you can carefully warm it by placing the butter on a plate and microwaving 10 seconds at a time until the butter yields to the touch without any melting. TIP #1: When creaming the sugar with cream cheese, the speed is slow! It takes a little longer however, it will ensure that the cream cheese and sugar are completely smooth and fluffy before you add it to the rest of your recipe. TIP # 2: Scrape the bowl edges often during the creaming process to ensure there are no lumps. “Scrape, scrape and scrape again!” Do not be tempted to hurry this process as you will never be able to eliminate the “lumpy” bits in the cream cheese filling or cheesecake custard. CHEF TALK: Have I told you the story of a resident chef on a volunteer trip that really needed a lesson or two on how to cut cakes properly? You can find the story in Learning Tips – Cutting the Cake. The same rules apply to Pies & Tarts, squares and brownies. The Learning Tips below bear repeating. Ensure that the pie or tart that you are going to cut is thoroughly chilled. This ensures a clean cut. Cutting a warm tart with a crumble top will result in an unattractive, therefore, less appealing tart. Start by placing the pie or tart on a firm, flat surface (it is advisable to do this on a cutting board and not on the display plate or silver presentation platter). Moisten a paper towel or cloth and place it under the cutting board to prevent the cutting board from slipping. Use the correct knife for the type of baked product you are cutting. It does make a difference in the end result. I find it easiest to cut this type of tart either near the sink where I can clean my knife under hot running water or filling a deep, narrow container (long enough to fit the blade of the knife) with hot water. For the first cut, run a long slicer knife under hot tap water, wipe the blade dry and cut down the center of the tart with an even stroke down, top to bottom, (12 and 6 o’clock). Slice the knife carefully down and out rather than lifting it and ruining the ganache topping. Clean the knife blade under hot water and wipe dry with the cloth. Now, turn the tart one-quarter turn and repeat this cut. The tart is now in four quarters. Repeat this process of cleaning the knife, wiping it dry to the desired size and number of portions. I find it easier to use a serrated knife for this type of tart – start with a few quick strokes on one edge of the tart and continue to the other side using the serrated edge of the knife to cut through the top without crushing the topping as you slice. Use the same technique of cleaning the knife blade with hot tap water and drying it between each cut. This makes a much cleaner cut without damaging the topping. CHEF TALK: There is a story of a resident chef on a volunteer trip that really needed a lesson or two on how to cut cakes properly. The same rules apply to brownies and squares. The Learning Tips below bear repeating. Why go to all the trouble of making (or buying) something wonderful and then ruin the look of it by cutting it poorly? I will show you how to cut it like a professional pastry chef. Ensure that the pan of brownies or squares that you are going to cut is thoroughly chilled. This ensures a clean cut. Cutting into a warm brownie or square with a crumble top, for instance, will result in an unattractive, therefore, less appealing, cut square or bar. Start by placing the brownies or squares on a firm, flat surface (it is advisable to do this on a cutting board and not on the display plate or silver presentation platter). Moisten a paper towel and place it under the cutting board to prevent the cutting board from slipping. I find it easiest to cut this type of brownie either near the sink where I can clean my knife under hot running water or filling a deep, narrow container (long enough to fit the blade of the knife) with hot water. Most of the brownie and square recipes in this book mention using the parchment paper handle method to line the baking pans. This is where you will see the benefit of this tip. For one: you can lift the “handles” of a well-chilled brownie or square and place the entire slab directly onto a cutting board. It is often very difficult to remove a brownie or square intact from the pan without damaging the first piece; or worse, cutting into the surface of an expensive baking pan. The use of the parchment paper handle method eliminates many problems. You do not have to remove the parchment paper before you start cutting. You can just push the paper away from the sides and flatten the parchment for ease of access to the square. If the square or brownie is chilled thoroughly, and firm enough, you can flip it over and remove the parchment paper, then turn back over to start the cutting process. For the first cut, run a long slicer knife under hot tap water, wipe the blade dry and cut down the center of the brownie with an even stroke down, top to bottom, lengthwise. Lift the knife carefully out and clean the knife blade under hot water and wipe dry. Repeat this cut on each side of the center cut to create four rows. Repeat the process of cleaning the knife, wiping it dry. Repeat the process width wise on the brownies, cutting the bars or squares to the desired size. CHEF TALK: I have to admit that I have had some fun with my students and The Egg Yolk & Sugar Phenomenon. I always enjoyed watching their reaction when the inevitable happened with this little experiment. Many of them have told me years later that they always recalled this very visual lesson of why you should never, ever combine the egg yolks and sugar until just before you are ready to use them in your recipe. There are many recipes that state, “combine the egg yolks and the sugar in a bowl.” Yikes!! To explain why this is of importance, let’s start with the EXPERIMENT. In a small bowl, place one egg yolk and sprinkle 1 Tablespoon of granulated sugar on top and leave it for a few minutes. When you come back to check, you will note that there is a bowl of hard, eggy protein globules that have formed in the bowl. WHY? There is a rather lengthy scientific explanation as to why this happens, but the shortened version is: there is an instant reaction to the egg yolk/sugar combination. The eggs will start to “cook” into unpleasant and more importantly, unmixable hard granular particles – you don’t want that!). CHEF TIP: This combination of egg yolks and sugar will work out just fine if you use them immediately, mixing with a whisk until the mixture reaches ribbon stage. This can be done by hand or over a bain-marie. CHEF TALK: I may refer to pure vanilla extract, vanilla bean paste; pure almond extract, coconut, orange and other similar flavourings. There are a number of reasons why these extracts should be a staple in your pantry, as explained below. Pure Vanilla extract is used extensively in baking and pastry dishes. Vanilla acts in the same way as salt does in savoury dishes, enhancing the flavours of the other ingredients in the recipe. Therefore, it is essential that a pure extract is used. Artificial extracts do not give your baked goods the same depth of flavour, and often, they can leave a lingering unpleasant “processed” taste. If you ask any pastry chef what they would choose as an indulgence or prized ingredient in their commercial kitchen, vanilla bean paste would be high on that list. It is essentially an emulsion of vanilla bean seeds and a sugar syrup base. It is “to die for” delicious. I will often substitute vanilla bean paste for vanilla extract in some recipes where the appearance of the tiny black specks of the vanilla beans is essential; for example; vanilla bean crème brulée or crème anglaise. This tiny package of Vanilla Bean Powder is prized in my kitchen. Vanilla bean powder is wonderful for so many reasons. It contains one thing: ground vanilla beans. I use it when I make vanilla pudding mix; or when I want to add vanilla flavour without liquid, like buttercream or chocolate. Vanilla Bean Powder can be purchased from Vanilla Food Company. (please note: this is not an affiliate link – I trust this company and buy all of my chocolate, vanilla and many of their other products and love their customer service). Pure Almond extract heightens flavours and is an essential ingredient in many classic baked goods. It is used in cakes, cookies, bars, cheesecakes, meringues, sauces and many other items. It is a clear sweet liquid that is very strong both in flavour and fragrance. It should be utilized with caution as over usage can make your baked goods take on a medicinal taste. Generally, one half of a teaspoon is the common amount in any recipe, although you may adjust to taste and recipe, as needed. COCONUT EXTRACT; ORANGE EXTRACT; BANANA EXTRACT; LEMON EXTRACT, ETC. In order to step up the flavour of baked goods that need a little “tweaking”, I sometimes use other flavourings available on the market. It is a great way to enhance an otherwise bland banana or coconut cream pie or brighten the citrus essence of a glaze or a meringue if adding the zest of a citrus fruit is unsuitable. CHEF TIP: One word of caution: Some of these flavourings, or extracts have an oil base, which means that adding them to egg whites while making a meringue can be disastrous. Any oil or fat – even a speck – can prevent a meringue from forming peaks. In this situation, you would add (by folding in) the flavourings or extracts to the meringue after it has reached stiff peaks. CHEF TALK: The term “folding” ingredients in a recipe is a technique that requires explanation. Folding ingredients into a mixture is another way of saying mixing or blending, the difference being, “folding” is a gentle way of incorporating ingredients into each other. The term “folding” is often used for meringues and certain pie and cake recipes. Using a large spatula, slide the spatula down one side of the bowl, bringing it under the mixture and around so that the spatula and ingredients turn over itself. This technique is especially useful when adding dry ingredients (such as flour or nuts) into an egg and sugar mixture. Keep repeating this step until there are no visible streaks in the mixture. Try making Italian Almond Macaroons to practice folding ingredients. For best results, use a large whisk or large spatula when folding ingredients into the mixture. For best results, if you are adding a lighter ingredient (such as an egg and sugar mixture) to a heavier mass (such as whipped cream), it is best to take a third of the ingredients and mix it in quickly, then fold the remaining ingredients into the mixture. CHEF TALK: Gluten-free baking presents challenges – to say the least. In my research, the blends that I worked with in the recipes on Urbnspice and in my books tend to work best for certain types of baking. For instance, the rice flour blend works well with tarts and recipes that do not call for a large quantity of flour, (such as the Quadruple Chocolate Brownie). Feel free to experiment on your own. Not all blends work well in all gluten-free baking. I found that even a minor substitution of brown sugar with granulated sugar made a huge impact on the final result of some gluten-free dough or baked products. Sometimes this worked in my favour – other times the results were surprising and enlightening. For certain recipes, I have had great success using the gluten-free flour blends that are easily found in stores. Some companies do an excellent job of researching, providing recipes and sharing information to their followers. Examples of these are Bob’s Red Mill 1 – 1 Baking Flour. The flour blend that follows is a blend that I have had great success working with. In the recipes, I refer to the type of blend (i.e. rice blend, all-purpose blend, or the name of the flour (white rice, brown rice, etc.). In the case of the rice flour blend, I have provided several substitutions for tapioca flour. My daughter is grain free as well as gluten-free, so experimenting with other grain free starches was important. Mix the ingredients with a whisk to blend thoroughly together. Store in an airtight container. I generally keep the flour blends in the fridge or freezer. CHEF TALK: The use of ice baths in a professional kitchen is as prevalent as a bain-marie. They are used for cooling cooked items quickly and safely before they are stored in the refrigerator. It is a necessary technique for any kitchen to follow for reasons of food safety. After straining custards or sauces, it is important to chill them quickly. It is best to have your ice bath ready before you are finished cooking the ice cream custards or sauces. An additional bowl with your custard in it that will fit easily inside the large bowl. Place ice cubes into the large bowl and set aside. Set the bowl with the custard inside the large bowl and nestle it into the ice cubes. Pour the cold water into the outside bowl so that the level of the ice and the water is the same level as the custard or sauce in the bowl inside. Stir occasionally to cool the mixture quickly. When cooled, cover and refrigerate until ready to use. For certain sauces, pastry creams or curds, it is advisable to place plastic wrap directly on the surface of the sauce to prevent a skin from forming. This should be done at the start of the cooling process. CHEF TALK: the term meringue is used often on Urbnspice. There are a few techniques to ensure that meringues achieve the correct consistency. Always start with a scrupulously clean mixing or mixer bowl and a clean whisk. Even a tiny particle of fat, of any kind, will prevent the meringue from achieving fluffy peaks. Any particle of fat can also cause the meringue to collapse while it is baking. When separating eggs, carefully separate one at a time into a small bowl, then place the egg white into a larger bowl with the other egg whites required for the recipe. Should any yolk break into the egg white, use it for another purpose rather than contaminate the other separated whites in the larger bowl. Room temperature egg whites will whip much better than cold egg whites. For best results, add a pinch of salt and a few drops of lemon juice or another acid like 1/8 teaspoon cream of tartar while whipping to gain the initial foamy stage (just before you start to gradually add the sugar). Flavourings should be added at the end of the whipping process as some flavourings (coconut, lemon and almond) could have an oil-based infusion and this will prevent the egg whites from achieving their peaks. There are three different stages of whipped egg whites: soft, firm and stiff. Follow recipe instructions. CHEF TALK: Taking time to prepare your baking pans can make the difference between a baking success and a baking disaster. There is nothing more disappointing than seeing most of your baked goods stuck to the bottom of a tart pan, cake pan, or cookie sheet. The following represents a few techniques to ensure that your baked goods have a good exit strategy. You can make any pan into a non-stick pan with this trick. Carefully coat the bottom and sides of your baking pan (tart pan, cake pan, muffin tins) with grease (butter, oil, vegetable shortening, or pan spray) to ensure that every corner, nook and cranny is coated. Dust flour over the pan liberally and shake it into every corner. Turn the pan upside down over a piece of parchment paper and give it a good hard tap to remove excess flour. Set it aside until required. Parchment paper is your best friend in the kitchen. It is my liner of choice and one that I use for many purposes. Trace a circle of parchment to fit the bottom of the tart pan or spring form pan you are using for ease of removal. For larger pans, cut a length of parchment paper to fit your cookie sheet or baking pan. I refer to cookie sheets on Urbnspice as baking sheets. A sheet of parchment is placed on top of the baking sheet and prepared pans or tart rings are placed on the baking sheet. Line the bottom of springform pans or ease of removal. Trace the bottom of the pan onto parchment and place the cutout piece parchment in the greased pan. Set the loaf pan on top of a piece of parchment that is approximately 3” larger on all sides than the loaf pan (the same as the height of the pan). Take a pencil and trace the bottom of the pan onto the parchment for accurate corner cutting. Then, taking a pair of scissors, cut to the marked corner in alternating directions (top or side) to achieve a pinwheel effect. Press the parchment wheel into the greased loaf pan and arrange it to fit neatly into the corners of the pan. In the case of convection ovens, there is one point to consider. Convection oven baking is far more effective when using light coloured baking sheets – dark coloured baking sheets often have the problem of over-browning your baked goods. If you own only dark coloured baking sheets – do not despair! Place a sheet of parchment on the baking sheets and you are good to go! There is an amazing product on the market that many bakers use. It is an aluminum foil with a non-stick surface on one side. It can be used in the same way as parchment paper. It really is a matter of personal choice, however, this product makes baking and cooking a much easier task. Sometimes perseverance is required in learning techniques and methods and just plain working through a learning process. If you need a word of encouragement, please read this post on never giving up. Proofing is a term generally used by bakers. It means the final rise of the shaped yeast product before baking. The photo below shows a cinnamon roll ready for the oven. It has expanded to fill the muffin well. I tested the proofing readiness by pushing my finger into the side and because the indentation remains, it is ready to be placed into a preheated oven. A reduction is simply reducing the liquid in a dish or sauce by half or more and then, rechecking the seasoning. If your dish is a braised item like a stew, transfer the meat and vegetables (keep these warm) from the liquid and reduce the liquid. Often, after a reduction, the seasoning that was initially used has been concentrated enough that only a small adjustment is necessary. Some examples of where a reduction has been used on this blog is Vichy Carrots, Honey Glazed Rutabaga. CHEF TALK: You will see the term “ribbon stage” referred to frequently in cooking and baking (for example: when making a Sabayon, hollandaise or whipping eggs and sugar together for many of the recipes on this blog). It means that you can literally make ribbons (or write) with the mixture when you lift the whisk or beater above the batter. This will happen when you have whipped or whisked the egg and sugar mixture or batter enough to achieve the correct thickness (incorporating air into the mixture). Place lemon juice or vinegar into a one cup measure. Let the mixture sit for 10 minutes and proceed with the recipe. CHEF TALK: I am a bit of a geek when it comes to straining. My apprentice students knew after a week or so with me that I had three words for them to remember: ‘strain, strain and strain’. It became a running joke in the kitchen. 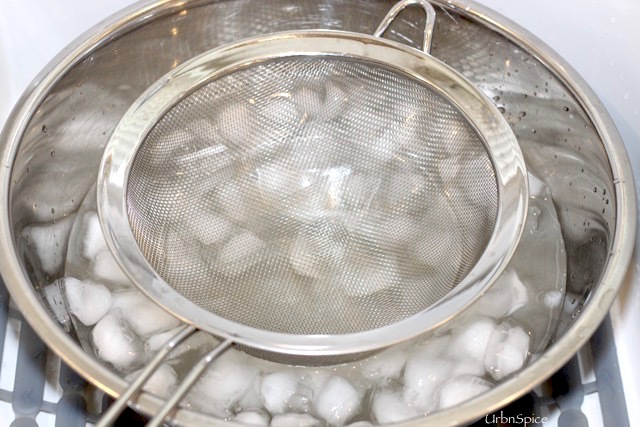 I had my own personal fine meshed strainer because I used it so often. If you want a beautiful creamy smooth cheesecake, ‘strain, strain and strain’……..you get the idea. The reason is most of these items have eggs in them or other ingredients that will leave lumps and bits that are really unpleasant when you bite into them. It takes such a little bit of effort to do this. Straining removes the chalazea of the egg – which is the twisted membranous strips joining the yolk to the ends of the shell. When cooked, they become quite rubbery and chewy in texture. Not good. To show you what this looks like: I strained the five eggs used in the Individual Baked Dark Chocolate Mousse in Crispy Wrappers before I added it to the chocolate mixture. Isn’t it good that I did this? This is what was left in the strainer! So, strain, folks – please! Straining liquids, custards, purees, or similar items in baking or cooking is a personal choice. It helps to achieve silky smooth mixtures. I would recommend having at least one multi-purpose strainer. CHEF TALK: This is one technique that has baffled and challenged many a pastry chef. Below, I have provided three methods using crème anglaise as an example of the process. Prepare a bain-marie with a medium saucepan. In a medium bowl, combine the egg yolks and sugar together and place the bowl over the bain-marie, stirring constantly to dissolve the sugar while warming the mixture. Meanwhile, heat the milk to boiling. Pour the hot milk over the warmed egg yolk/sugar mixture and stir until the sauce coats the back of a spoon. This will happen almost immediately as both mixtures are very hot. To eliminate any guesswork, use a digital thermometer and cook (while stirring) set with an alert on the thermometer or until the sauce reaches a temperature of 182 degrees F (83 degrees C). Meanwhile, bring the milk to a boil in a saucepan over medium heat. Remove from the heat for the next step. Now, mix the sugar into the egg yolks (from Step 1). Temper the egg mixture by whisking in a small amount of the hot milk into the bowl. Then slowly transfer the egg mixture into the remainder of the milk in the saucepan. Cook the sauce gently, stirring constantly, until the sauce coats the back of a spoon. This is the tricky part! It cannot come to a boil, or you will end up with bits of scrambled eggs in your sauce. No amount of straining will help make this into a silky smooth crème anglaise. TIP: To eliminate the guesswork, use a digital thermometer and cook to 182 degrees F (83 degrees C). CHEF TALK: I feel quite strongly about this particular topic. If you want to step it up a notch in your kitchen, whether a professional kitchen or at home, roasting your nuts before using them in your recipe is a surefire way to increase the flavour and quality of your baked goods to a higher level. An oven temperature of 325oF/162oC seems to be the magic temperature to toast nuts. You can roast them at a higher temperature of 350oF/180oC. However, you will have to be a little more diligent in watching them and you will need to ensure that you turn them occasionally to prevent burning. It is always advisable to toast nuts before chopping to prevent the possibility of burning the nuts. Every oven is different, so be diligent in watching the nuts, and set the timer to be sure. Toast different types of nuts separately – they all toast differently. Whole Hazelnuts: Roast for approximately 10 – 15 minutes. NOTE: Hazelnuts are a little different in that the paper-thin hazelnut skin, when roasted, can be bitter. If the hazelnuts are natural, (skin on) the oven roasting will cause the skins to crack. After 5 – 7 minutes of roasting, rub the hazelnuts briskly with a rough towel to remove some of the skins and repeat the process of roasting and rubbing until most of the skins are removed and the nuts are toasted. High Fat Nuts: (Examples: Macadamia, Cashews or Pine Nuts). Watch these carefully as the high fat nuts caramelize (brown) very quickly and it is an expensive error if these gems are over-done. Roast for 5 – 10 minutes, watching carefully until the nuts achieve a light golden colour. Are you familiar with the word tweaking? The term “tweaking” is sometimes used in technological communication, but chefs have used the expression as part of their kitchen terminology for years to describe the path they take to perfect flavours. This is called a study in flavour amendment. I discuss this at length in a separate post called TWEAKING – A STUDY IN FLAVOUR AMENDMENT. For the recipes on this blog and in my cookbooks, I use natural unsweetened cocoa powder. Pastry chefs are a curious sort – always wanting to understand the hows, and the whys and the why nots of baking. This is definitely one of the LEARNING TIPS that I have learned through trial and error. Using other types of cocoa powders without any regard to the different properties can lead to some very interesting and exasperating results! For example, if you unknowingly substitute Dutch process cocoa for a recipe calling for natural cocoa powder, you may wonder why the baked good turned out like flat puddles or with no structure or body. This is due to the fact that this type of cocoa powder is alkaline based. In this situation, the eggs used in the recipe will never quite set up because of the properties in the alkaline based cocoa (not sufficient acid in the batter). Substituting flour for cocoa powder: you can use cocoa powder in just about any recipe, however, you must keep in mind that cocoa powder is a drying agent, just as flour is, so adding cocoa powder on top of the amount of flour called for in a recipe will result in a very dry product. Instead, deduct the amount of cocoa that you use from the quantity of flour (substitute part of the flour with cocoa powder to equal the total amount of flour called for in a recipe). For recipes that you wish to convert into a chocolate version, try using one part cocoa powder to three parts flour used in a recipe For example: If the recipe calls for 1 cup of flour, use instead ¼ cup natural cocoa powder and ¾ cup flour for a total of one cup. I use this technique in a recipe called Tiger Dough, which you will find is a variation of a Nut Butter Cookie from this post. Have fun with this one! I hope you have found these LEARNING TIPS helpful. If you would like another learning tip discussed, please leave me a comment. I would be happy to include it in this section on LEARNING TIPS. Thanks, Avani. I will be continually adding additional relevant tips to the Learning Tips post as I add content to my UrbnSpice site. Thank you for visiting UrbnSpice. SO many wonderful tips!! Definitely bookmarking this for reference! Many thanks, Jessica! I appreciate your kind words. This is such an awesome post Denise! Thank-you for sharing, this is a great resource for everyone. How kind of you to say so, Kristen. Thank you so much for your comments. This is such an exhaustive post, Denise! I bookmarked it for later reference, as you know I love to bake and there is so many useful information here I might need. Thank you so much, you did a fantastic job and touched all the tricky subjects in baking. I appreciate your kind comments very much, Nicoletta as I know that you can relate very well because of your love of baking. ❤️😘. I hope that you will find some of this reference material useful. Oh, yes, Terri! You are right. 😉 These Learning Tips were learned in the school of hard knocks along my baking journey. It is fun for me to be able to now pass them along to my wonderful readers – like you! Many thanks for your comments.